An original letter of correspondence between Randall Chase and his father Sydney Octavius Chase and his uncle Joshua Coffin Chase. Topics discussed in the letter include the Atlantic Coast Line Railroad Company's proposition to set poles through Isleworth Grove. Original letter from Randall Chase to Sydney Octavius Chase and Joshua Coffin Chase, February 17, 1931: box 49, folder 20.83, Chase Collection (MS 14), Special and Area Studies Collections, George A. Smathers Libraries, University of Florida, Gainesville, Florida. Digital reproduction of original letter from Randall Chase to Sydney Octavius Chase and Joshua Coffin Chase, February 17, 1931. Chase Collection (MS 14), box 49, folder 20.83, Special and Area Studies Collections, George A. Smathers Libraries, University of Florida, Gainesville, Florida. A. E. Carpenter 'phoned this morning that Mr. Crawford, representing the A.C.L. was in his office, and that he had a letter from Mr. McCranie with reference to the poles thru Isleworth. As I understood from Mr. Carpenter the A.C.L. 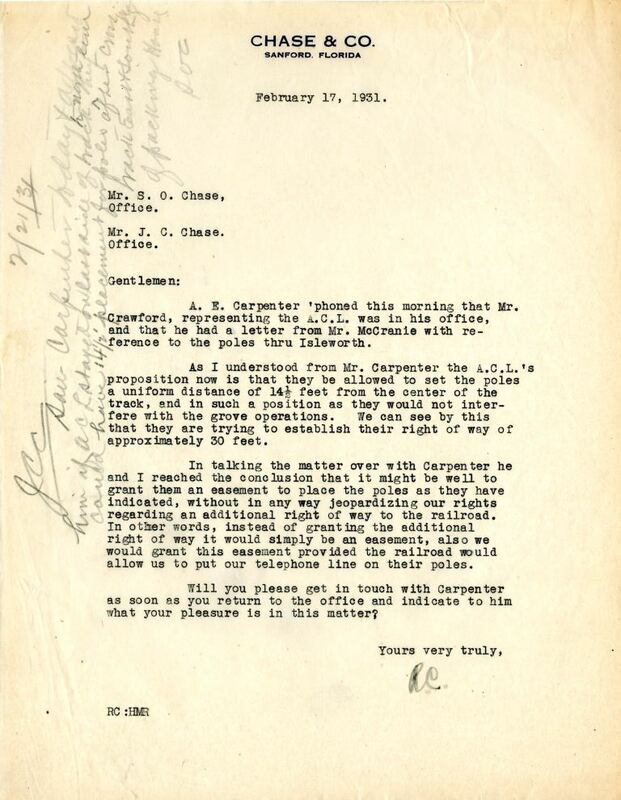 's proposition now us that they be allowed to set the poles a uniform distance of 14 1/2 feet from the center of the track, and in such a position as they would not interfere with the grove operations. We can see by this that they are trying to establish their right way of approximately 30 feet. In talking the matter over with Carpenter he and I reached the conclusions that it might be well to grant them an easement to place the poles as they have indicated, without in any way jeopardizing our rights regarding an additional right of way to the railroad. In other words, instead of granting the additional right of way it would simply be an easement, also we would grant this easement provided the railroad would allow us to put our telephone line on their poles. Will you please get in touch with Carpenter as son as you return to the office and indicate to him what your pleasure is in this matter? Saw Carpenter today and advised him if ACL[?] stayed [?] of track they could have 14 1/2' placement for poles after cross. Chase, Randall. 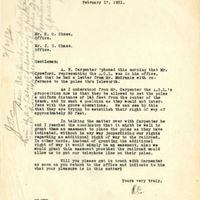 “Letter from Randall Chase to Sydney Octavius Chase and Joshua Coffin Chase (February 17, 1931).” RICHES of Central Florida accessed April 25, 2019, https://richesmi.cah.ucf.edu/omeka/items/show/2765.